I recently visited my OB unexpectedly after experiencing some strange symptoms. The news I got was a surprise to me; my blood pressure was extremely high. As a result, the doctor indicated that there was a possibility I would need to be scheduled for an induction or c-section in the next week or two, meaning this baby could be coming significantly sooner than we were expecting. Thankfully, my blood pressure has been relatively stable since then, so I'm hoping we can just let baby come on his own time. That said, it really got me thinking... panicking might be a better word. TWO WEEKS!? Of course, I was worried about the well-being of my growing baby. But I was also worried about something else: The looming to-do list. You know... that crazy long list of insanely ridiculous things that a nesting mother thinks need to be achieved before baby's arrival? Mine is long. And intense. So intense that half of my house is literally in shambles right now in the midst of home improvement projects and HGTV hoarder-style purging, with a little bit of 'unexpected home-owner catastrophe' sprinkled on top. So yes, I panicked. A couple of days ago, as we sat at the table for breakfast, I listened to Mitchell and Lincoln's conversation about baby brother. They chatted back and forth about his impending arrival and Lincoln becoming a big brother. After a moment of silence Lincoln said, "Lincoln was born, too. 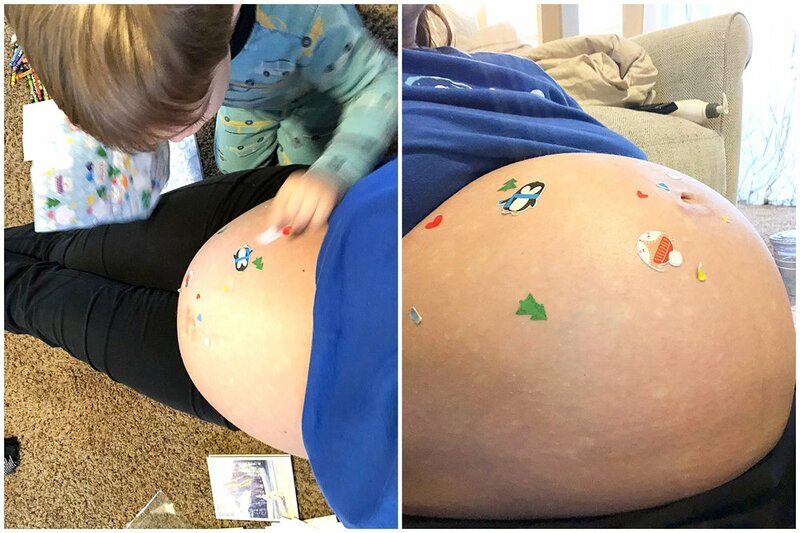 Lincoln was in mommy's tummy, too." Yes, sweet boy, you were, and it feels like it was just yesterday. Yet here you are, nearly two and a half years old, having normal conversations with us at the table while you eat with a knife and fork and burst with more personality than I can even handle most days. My pregnancy hormones took hold and I got teary-eyed right then and there. Suddenly, the stress over my list of home projects and house cleaning melted away. I could care less that the siding is falling off the house, that our fireplace is covered in duct tape, that my bedroom looks like a construction site, or that the nursery is unfinished. At that moment, all I wanted was to enjoy every moment I have with my sweet Lincoln while he is still an only child. His life (and ours) will be richer and more full once baby arrives. But it will be different in many, many ways. Go on a coffee shop or ice cream date. Build a tent and spend the day doing our regular activities (reading, coloring, playing) in it. Bake something fun and delicious. Go for a walk and explore, just the two of us - no stroller, no baby carrier. And lots more things. Lots more light-hearted, fun, exciting things that can be just the two of us, no distractions. Once baby is here, Mitchell and I will be very intentional to be sure that both boys have alone time with each of us in addition to their time together. I know this 'list' isn't pressing and that we will continue to do things as just mother and son once baby brother arrives. But right now, my heart feels lighter and happier, and I feel less pressure about the 'stuff' because my little one opened my distracted eyes to the importance of these precious, fleeting moments. Thank you, sweet Lincoln. You always know just what this momma's heart needs. And here are some simple iPhone snaps of our fun thus far, because I wasn't about to waste even a minute of our special time together toting around the camera or editing photos to make this blog look pretty.